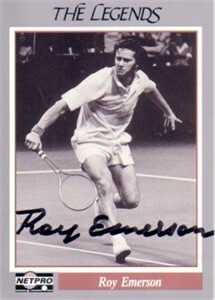 Netpro Legends tennis card autographed by Hall of Famer Roy Emerson, winner of 12 major singles titles. Obtained in person, with certificate of authenticity from AutographsForSale.com. ONLY ONE AVAILABLE FOR SALE.